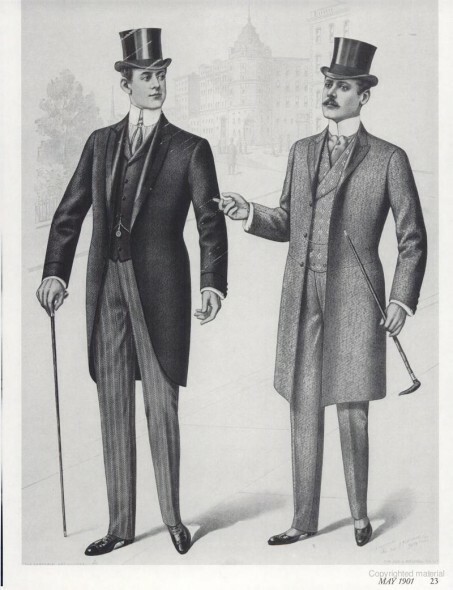 From "Men's fashion illustrations from the turn of the century"
According to Mrs. Humphry, “It is a duty one owes one’s friends to dress well” and “it is absolutely true, though in a very limited sense, that the tailor makes the man.” Furthermore, she instructs, “if he commits flagrant errors in costume he will not be invited out very much, of that he may be certain.” Edward VII was a stickler in matters of dress, and was not above scolding his friends, Prime Ministers, and foreign dignitaries if they appeared in anything less than correct. These expectations kept the Edwardian gentleman as much on his toes as it did the ladies, and the introduction of sports, new leisure activities, and the growing number of decorated men (knighthoods, medals, etc) increased the pressure. Nevertheless, unless your valet or tailor were incredibly uninformed, the basic guidelines for daily dress was quite easy to remember. Park suit: grey or light-brown frock-coat, with waistcoat and trousers to match. Can also be worn at Ascot. Summer Wedding: grey frock-coat suit, silk hat, grey suede gloves, boots, light waistcoat, and dark grey tie. Summer morning in the Park: straw hat, or low hat and tweed suit, or a black coat and silk hat. Straw hats or low hats were never worn with black coats of any kind. Theater dress: dress coat, white waistcoat, white tie, black trousers, silk top hat.